If you sell, manufacture, or distribute potable water treatment or transfer products in North America you are required by law to comply with NSF/ANSI 61: Drinking Water Components—Health Effects (NSF 61). First published in 1988, NSF 61 established the requirements to control adverse human health effects from potentially dangerous products or materials that may come into contact with drinking water. Developed by a team of scientists and industry experts, NSF 61 sets the material and design criteria for water components including protective barrier materials, joining and sealing materials, mechanical devices, pipes and related products, plumbing devices, process media, and non-metallic water materials. Potable water system components can be divided into two groups of regulation: regional water treatment plants and drinking distribution systems. Drinking distribution systems from the water meter down or located inside a building are normally regulated by state or local plumbing codes. All major plumbing codes require the use of NSF 61 standards, and the specific requirements for those product types can be found in state or local plumbing codes. The figure below (the most current ASDWA member survey) shows that 48 out of 50 states have adopted the standards of NSF 61 for water treatment and distribution. “NSF/ANSI 61.” NSF RSS. The Public Health and Safety Organization, n.d. Web. 07 June 2017. The words “certified” and “compliant” mean two very different things when relating to NSF 61. Certification is only attained through extensive third-party product testing, material analysis, plant inspections, and the monitoring of every step of a product’s development. Additionally, certification is not merely a one-time event, but an ongoing process which includes intermittent on-site evaluations and continued testing. A plant that fails an NSF 61 compliance test for a given product is provided only a limited timeframe to resolve the issue. When a product has been approved, it may then claim to be either “NSF certified” or “NSF listed”, and may display a certification mark. Products claiming to be compliant are more than likely making this claim based on their own assessment, which may or may not be valid. Common compliance language includes: “Compliant with NSF 61”, “Tested to the requirements of NSF 61”, or “Meets the requirements of NSF 61”. While striving to meet the standards of NSF 61 is commendable, only products that have been independently tested and are consistently evaluated can truly claim certification. A product that has been changed from its original design since certification is no longer certified. The NSF’s database keeps up to date information on product certification. All Mountain West states require compliance with the standards outlined in NSF/ANSI 61 Drinking Water Components—Health Effects for materials and components used in drinking water systems. It is the responsibility of the end user to find and approve only products that are up to date on NSF 61 certification. Providing the highest-quality products for our customers is a priority for Nickerson Company, we review all products sold for use in potable water systems for NSF 61 compliance. The government is requiring us to use a NSF-61 water pump on our hand washing trailer used for the forestry. We are currently using the Pentair brand Shurflo model 2088-594-154 pump. Does this pimp meet the certification? If not what is a pump that is this size that would? 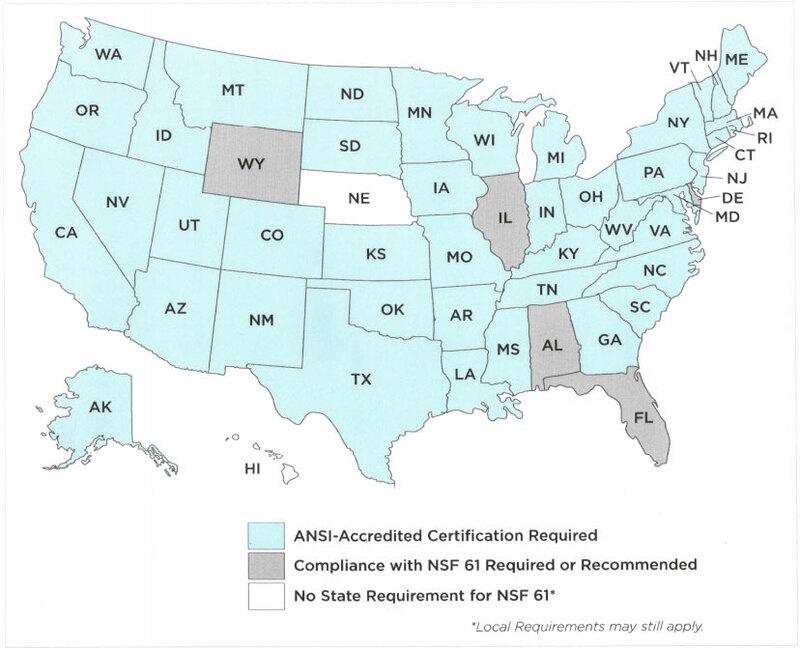 Here is a link that covers what NSF/ANSI 61 certification means. Here is another link that shows all the pumps manufactured by Pentair that are currently NSF/ANSI 61 certified. I do not see this pump on this list, so it will not meet the necessary requirements. To be able to find a pump that meets the requirements, we would first need to know what your operating conditions are. I believe this link shows the normal performance of your pump. What is your operating pressure? This is usually measured in PSI or FTH. What is your capacity? This is usually measure in GPM. It looks like the current pump have a capacity of 3.3 GPM. If you can provide/confirm this information we should be able to find a good replacement pump for you that is currently NSF/ANSI 61 certified. P.S. You can send an email to sales@nicopumps.com for more information.